NetEnt, leading developer of exciting world-class digital casino games, will underline its pioneer status at ICE 2017 with a presentation of its latest developments within virtual reality (VR) and live casino. Visitors to Stand N3-242 will see and experience the innovations, straight from the company’s development labs. The rapidly-emerging VR market is a high-growth area into which NetEnt is well positioned to lead its customers. The premium supplier will share news and showcase the progress it has made since revealing its praised proof-of-concept prototype 12 months ago. NetEnt will also reveal new additions to its innovative live casino offering. Having committed to developing its mobile live casino product in collaboration with players, the result is an incredible experience that truly pushes the boundaries, and is the most immersive product for mobile on the igaming market today. The company is pleased to announce that its Live mobile offering is growing with a new Common Draw Black Jack game that will launch on March 27. It will also present NetEnt Live Rewards, the first deliverable from NetEnt Engage™, a suite of products, features and functionality designed and develop to maximize levels of loyalty and retention, boosting player engagement. Live Rewards is a long awaited solution to an industry need – innovative promotions on the Live gaming scene. It’s a tool designed to create engagement by enabling instant rewards with real-time, in-game notifications for players. Operators can reward players with cash, bonus or free rounds on NetEnt video slots, an opportunity to cross-sell between different products. The Live Rewards process allows promos to be created in less than two minutes and campaigns to be planned in greater detail, opening the door to more personalised offerings that will provide differentiation to casinos and resonate deeper with players. Live rewards will initially be launched as a part of NetEnt’s live casino offering, and will be brought to the slot games portfolio later this year. Finally, in keeping with tradition – but adding a signature NetEnt twist – CEO Per Eriksson will pull back the curtain to reveal the details of not just one, but two, new branded titles. NetEnt’s branded games continue to surge in popularity. During the past 12 months, they have dominated the most-played charts, collected a number of awards, and driven considerable transactional growth for the company and its customers. 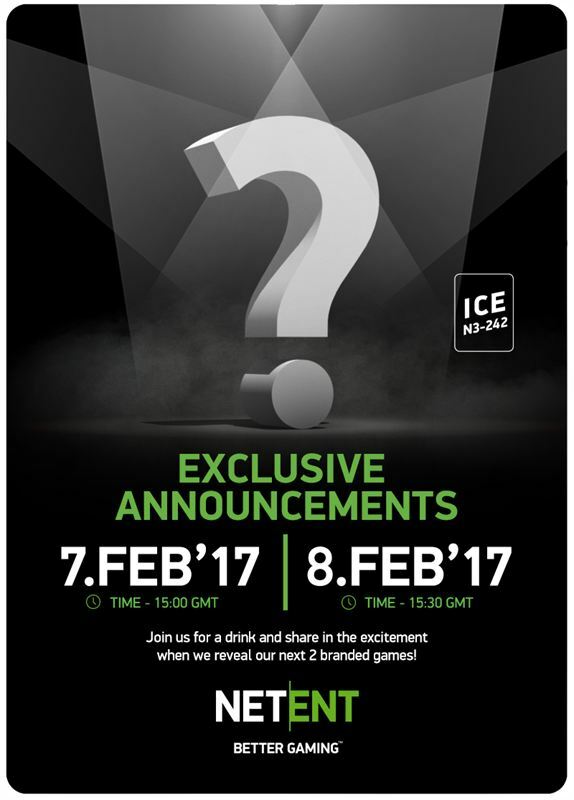 Join the NetEnt team at 15:00 on day one at ICE, and at 15:30 on day two, as the eagerly anticipated games will be announced. “We know the importance of branded games to our customers and their players, which is why we put a lot of effort into securing the best franchises, and creating the most imaginative and enjoyable licensed products. “Like all our games, NetEnt branded titles continue to gain popularity among players, which is driving considerable transactional growth for NetEnt and our partners. We certainly raised the bar with the NetEnt Rocks Tour and can’t wait to have twice the fun this year with a double announcement,” said Eriksson. Visit NetEnt at Stand N3-242 at ICE Totally Gaming, held at ExCeL London, from 7-9 February 2017.